Arrive in Pakse, capital of Champassak Province. Situated in southern Laos near the Thai border, at the confluence of the Mekong and Se Don rivers, Pakse’s colonial legacies are best reflected in its riverside old quarter. Enjoy the rest of the day at leisure at your riverside lodge base, located on the charming, car-free island of Done Daeng, known as “Red Island”. Relax on the white sand beach edging the Mekong, which faces picturesque Vat Phou temple (Wat Phu) and take-in the exceptional natural beauty and unspoilt charm of southern Laos. An expanse of highland formed from an ancient volcano, verdant Bolaven Plateau is resplendent with lush jungles, rivers, scenic farmlands and diverse ethnic communities. Spend the day exploring this naturally beautiful and cool climate elevated region. Visit the area’s celebrated tea and coffee plantations that thrive on the highland’s super fertile volcanic soils. Coffee beans cultivated here are regarded as premium quality. We also stop at dramatic waterfalls, some plummeting into 200m (656ft)-high spectacular gorges. Dating between the 6th and 13th centuries, pre-Angkorian Vat Phou temple (Wat Phu) was part of the greater Khmer Empire, linked by ancient highways to Cambodia’s Angkor Wat. 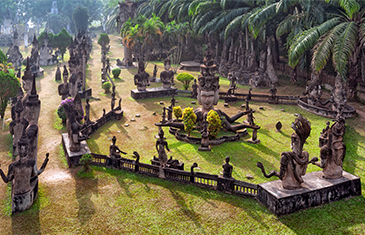 Considered the birthplace of Khmer Hindu architecture, this picturesque Hindu temple complex is now a UNESCO World Heritage Site. Explore the mythical temple ruins and tumbledown structures. 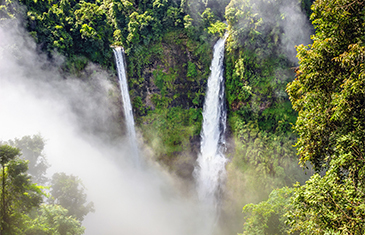 Continue to the 10km (6mi)-long Khone Pha Pheng Falls, Southeast Asia’s largest waterfalls and one of Laos’ most magnificent natural attractions. Hear the thunderous roar and gaze at the awesome power created by millions of litres of water crashing over rocks. Wondrous Si Phan Don, or ‘The 4,000 Islands’ is a mass of mostly uninhabited, multi-sized islands amidst a 14km (8.5mi)-wide, meandering section of the Mekong River. Embark on a traditional long-tail boat and cruise amongst the Si Phan Don riverine archipelago, heading south of Don Khong, the largest inhabited island here. Explore this peaceful rural island where locals live out a simple life. Once a minor 19th century French Indochina settlement, Don Khone reveals a handful of colonial-era buildings including an old French railway station. Continue to awesome Liphi Waterfalls, nicknamed the “Corridor of the Devil”, a natural border between Laos and Cambodia and habitat of freshwater dolphins. In the afternoon, we arrive in Vientiane, Southeast Asia’s smallest capital city. Nestled along the banks of the Mekong River, near the Thai border, this former French Indochina trading post exudes a laidback ambiance and old-world charm. 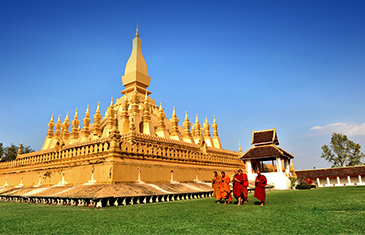 Spend a fascinating day discovering some of Vientiane’s most significant landmarks and historic buildings. Wat Sisaket is one of the capital’s oldest surviving temples, noteworthy for its famous cloister wall housing thousands of tiny Buddha images. In downtown Vientiane, spectacular That Luang, a 44m (147ft)-high gold covered Buddhist stupa, is regarded as the nation’s most important monument. We also make a stop at iconic Patuxai Victory Monument, an Arc de Triomphe-like war monument adorned with Lao mythical designs and dedicated to those who fought in the struggle for independence from France. Scattered across the hilly Xiang Khoang Plateau, the enigmatic “Plain of Jars” is one of Southeast Asia’s most important prehistoric sites. This megalithic archaeological landscape consists of around 2,500 sandstone jars grouped together in clusters over a vast area. Ranging in height from 1m to 2.5m (3ft to 8ft), archaeologists estimate these giant jars are around 1,500-2,500 years old, dating to the Southeast Asian Iron Age. The ancient cylinders’ exact purpose remains a mystery, although most likely associated with prehistoric burial practices. As this area was heavily bombed by US forces during the 1960s and 1970s so-called “Secret War”, thousands of unexploded ordnance now litter the countryside. Time permitting, we visit the Mine Advisory Group, who operate a project to make the area safe from the dangers posed by unexploded ordnance. 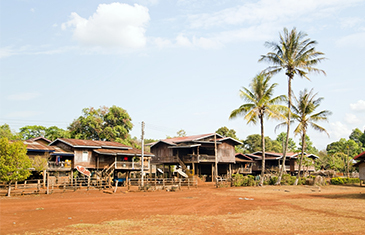 After visiting a second site at the Plain of Jars, we travel to the small riverside town of Sam Neua, situated in north-eastern Laos. One of Laos’ least-visited provincial capitals and emanating a rugged frontier atmosphere, Sam Neua’s real drawcard is the lush hilly countryside in which it basks. Nevertheless, take a pleasant riverside stroll and tour the vibrant and photogenic food market, a fine example of the province’s character and colourful ethnic diversity. Set deep amid karst limestone cliffs, near the Vietnamese border, the Vieng Xai Caves are actually a remarkable historic site. A number of these well-preserved caves are open to guided tours. During the Second Indochina War (1964 to 1975), the impressive Vieng Xai Caves were headquarters to the Pathet Lao Revolutionary Government. What amounted to a “Hidden City” supported around 20,000 personnel during these war years, sheltering from intense aerial bombardment from the US military. Pathet Lao leaders all had homes here and directed the war from the cave complexes. Besides living quarters, the cave-chambers housed schools, hospitals, markets, government ministries, a radio station and theatre, all of which received heavy usage during the war years. Spend a fascinating day experiencing some of the attractions surrounding Sam Neua. This includes beautiful Wat Phoxaysanalam, a temple housing a sacred Buddha statue dating back to around 1565. We also explore Hintang Archaeological Park, a collection of prehistoric megalithic sites scattered along a remote mountain ridge and lush jungle vegetation. These comprise of hundreds of standing stones, 3m (10ft) – tall, some over a metre in diametre, inscribed with various designs. Archaeologists estimate these ancient stones are at least 1,500 years old, roughly the same age as those at the Plain of Jars, and perhaps relics from the same civilisation. Their function is also believed to be of a funerary nature. Travel from Sam Neua to Luang Prabang via Nong Khiaw, regarded as one of the most photogenic spots in Laos for its spectacular, steep limestone cliff scenery. On this road journey, enjoy vistas of forested mountains and timeless rural villages surrounded by rice fields. Time permitting, we get a unique opportunity to celebrate an authentic Baci ceremony at a local family home. An integral part of Lao culture marking milestone events, this ancient ritual is based on the belief that the ‘kwan’ (or soul), which watches over the body, will be realigned. The Baci ceremony is typically administered by a village elder, on hand to tie a symbolic white cotton thread around your wrist, while chanting an invocation to strengthen the blessing’s power. Set at the confluence of the Mekong and Nam Khan rivers, encircled by misty mountains, the ancient royal capital of Luang Prabang is considered the heart of Laotian culture. Now a UNESCO World Heritage Site, magical Luang Prabang still emanates an ethereal-like charm. Explore this incredibly picturesque town on a guided walking tour, highlighting the stunning colonial-era and traditional Lao architectural legacies. Amongst Luang Prabang’s iconic gilded temples (wats), we visit one of its most beautiful, the early 18th century Wat Sene, or “Temple of a 100,000 Treasures”. Here, we participate in a Buddhist blessing ceremony, believed to impart health, happiness and longevity. Continue to picturesque Kuang Si Waterfall, one of the region’s biggest waterfalls, where cascading tiers of waterfalls plummet down into azure pools engulfed in jungle. Cruise along the Mekong River on a local-style long tailed boat to where the Nam Ou and Mekong rivers converge. Here, disembark at Pak Ou Caves, perched high on a limestone cliff on a river islet. These two grottoes house over 4,000 Buddhist statues and images, ranging in height from mere centimetres to 2m (6.5ft). Worshippers, including Lao royalty, have visited this revered cave-temple for centuries. En-route, we stop at several craft villages, surrounded by verdant rice paddies, that produce traditional textiles and Lao whiskey. 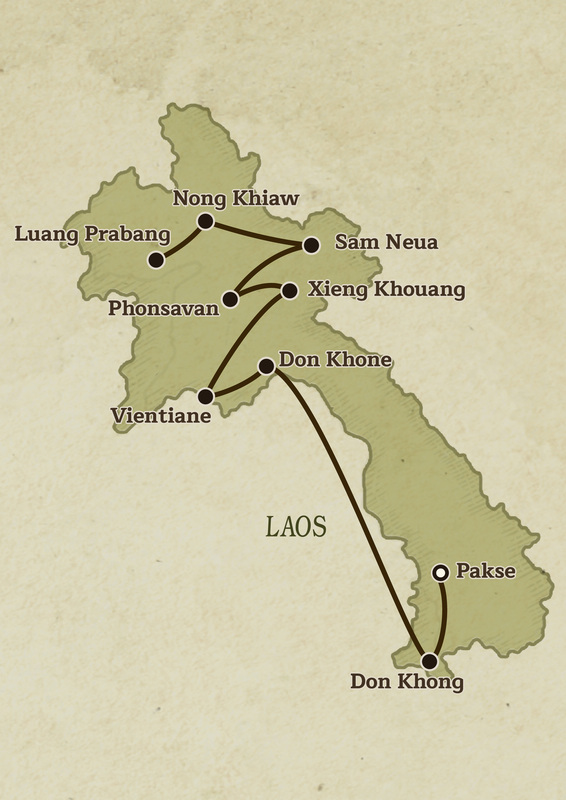 Return to Luang Prabang and transfer to the Luang Prabang International Airport for your onward flight.